This seminar explores the available mechanisms under the Asian Development Bank’s Infrastructure Referee Programme, a grant-funded initiative of ADB’s Asia Pacific Project Preparation Facility (AP3F), where parties in a PPP infrastructure project may obtain funding support and technical assistance for dispute prevention and resolution. The cross-border nature of many PPP contracts has created many layers of complexity when disputes arise during the project development cycle, which may impact the project’s bankability and closure. Dispute resolution may benefit from the active assistance of a neutral third party, i.e. a referee or mediator. Speakers at this seminar include ADB’s Director for the Office of Public-Private Partnerships Mr Takeo Koike, and leading infrastructure mediator and adjudicator Mr Chow Kok Fong. They will share how ADB and SIMC can help parties resolve disagreements efficiently. 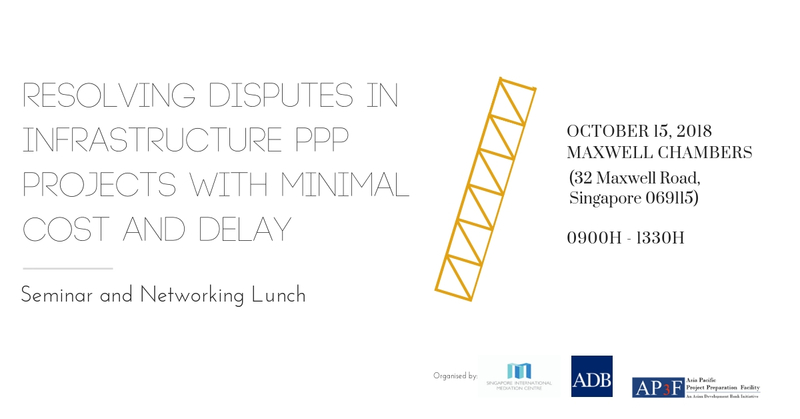 Mr Chow will also co-chair a panel discussion to discuss how dispute resolution for PPP projects has evolved, and how public and private sector leaders can obtain a fair, enforceable, and sustainable settlement. ADB’s internal estimates indicate that infrastructure needs in Asia and the Pacific will exceed $22.6 trillion through 2030. Available funding from government funds falls far short of the investment need. Public–private partnerships can play an important role in addressing this massive requirement. However, the flow of private infrastructure investment has been known to be impeded by a lack of reliable and investor-friendly regulatory and legal conditions. This event includes a networking lunch and is free, but participants should RSVP their attendance via an e-registration form available here by Oct 10. For more information, please download the full seminar programme here. All enquiries should be made to Ms Lee Zhuomin at (65) 6635 2460/ leezhuomin@simc.com.sg. This event is organised by the Singapore International Mediation Centre in partnership with the Asian Development Bank.